Path to Freedom | The Kids Beat | Kids VT - small people, big ideas! 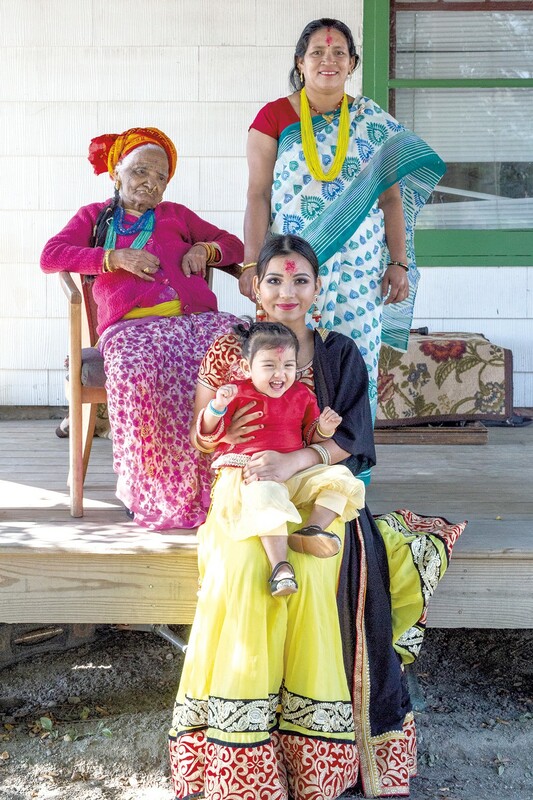 The Bhattarai family's journey from a refugee camp in Nepal to their home in Winooski is chronicled in words and photographs in A New American Family, an exhibit hosted by the Winooski Peace Initiative at the O'Brien Community Center. It tells the story of Prem and Mana Bhattarai; their four children; their granddaughter Blossom; and Prem's mother, Duku. Prem and Mana met in a refugee camp in Nepal after being stripped of their citizenship by the Bhutanese government in the early 1990s. They spent two decades in the camp, where their children were born, before being resettled in Vermont in 2012. Michelle Saffran photographed the Bhattarai family over the course of a year. Her photos range from striking portraits to snapshots documenting the Bhattarais' daily life, from watching a Nepali television program to grocery shopping. Writer David French recorded family members talking about their experiences in the refugee camp and here in America. His excerpts accompany the photos. "In Nepal if you want to buy something, you have to walk to all different markets to find everything," eldest daughter, Renuka, said. "Here you get it in one place. The first time we went to Costco, it was like going to heaven." "A New American Family" is on display through July 31 at the O'Brien Community Center at 32 Malletts Bay Ave. in Winooski. The center is open Saturdays-Thursdays from 6 a.m. to 5 p.m. and Fridays from 6 a.m. to 7 p.m.